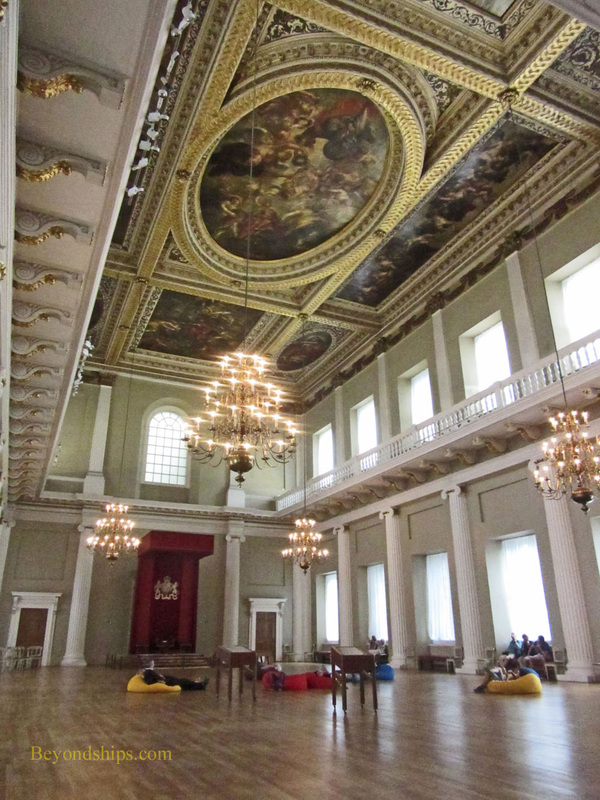 A visit to the Banqueting House is really about seeing one room. But what a room! Most of this three story building is taken up by the huge hall where receptions, banquets and ceremonies were once held. It is two stories high and stretches most of the length of the building. The room is a double cube. It is 55 feet wide, 55 feet high and 110 feet long. This is no coincidence as obtaining perfect mathematical proportion was a priority for the Banqueting House's architect Inigo Jones. It was a very successful endeavor as the room has a harmonious feel. This room is not heavy and oppressive like some grand ceremonial rooms. Banks of tall windows run along each of the longer sides of the room letting in a considerable amount of natural light. Supporting the galleries that run along the longer sides are white Ionic columns. These and Corinthian pilasters on the next level have just a touch of gold highlighting, which coveys richness while retaining elegance. At the far end of the room opposite the entrance is a small dais upon which the monarch would sit. Courtiers, ambassadors and others wishing an audience would see the monarch framed in this elegant and majestic setting. They would then have to walk a considerable way to come within speaking distance of the monarch. 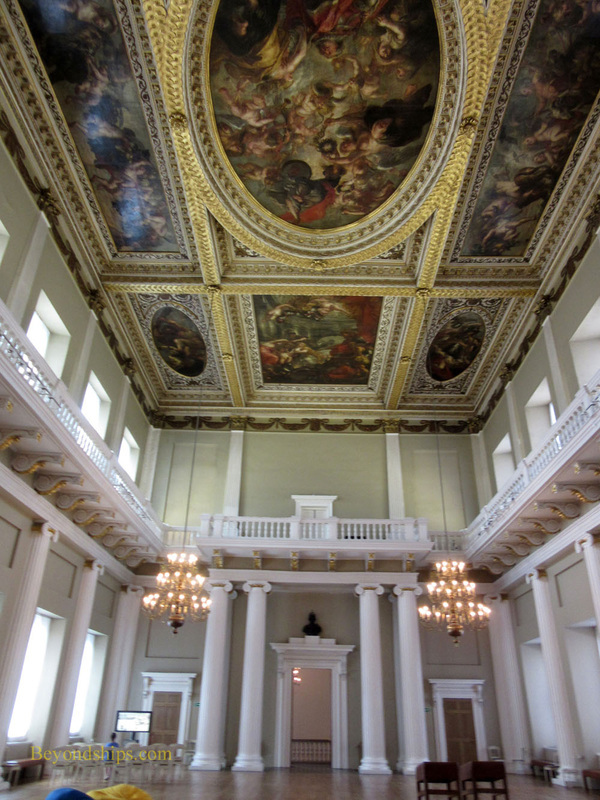 All of the time, they would be walking beneath the crown jewel of the Banqueting House, the Ruben's ceiling. Set amidst gold decoration, the canvases by Sir Peter Paul Rubens are rich in color and action. They proclaim that kings are not mere earthy mortals but rather have been chosen by God to rule - - the very message the early Stuart monarchs wanted to convey. The ceiling has three main canvases as well as a number of supporting paintings. Closest to the entrance is “The Union of the Crowns.” When James I became king of England, he was already king of Scotland. Although the two countries were not legally united for another century, they were thus unified in that they shared the same monarch. The painting shows James commanding the personifications of England and Scotland to bring his son Charles to the throne as Minerva looks on. Over the dais at the opposite end of the room is “The Peaceful Reign of James I.” This canvas shows the first Stuart Monarch being crowned with laurels by winged figures in the presence of personifications of peace and plenty. ﻿Above: The view from the entrance. To make it easier for today's visitor to study the paintings, cushions have been placed in the center of the room so that you can lay back and look upwards at the paintings. Also, there are tables with mirrors that capture the reflection of the paintings above. They are on wheels and can be moved about so as to give a reflected view of the different paintings. Another alternative is to sit on the benches on either side of the room. Beyond the art and architecture of this room, there is a sense of history embedded in its walls. The room was designed to further the cause of absolute monarchy that James I and Charles I sought to impose upon Britain. Tragically, Charles' insistence on his divine right led to civil war. At its end, Charles was executed just outside of the Banqueting House. What were his thoughts as he was led through this room to the scaffold? Did he cast an eye upward at Ruben's paintings as he walked through? Ironically, the final chapter in this conflict over whether the monarch or the people should govern took place in this room some 40 years later. When William and Mary were offered the throne at the end of the Glorious Revolution, it was on the condition that they accept the English Bill of Rights limiting the power of the monarch, setting out the rights of Parliament and protecting free speech. As the provisions of the bill were read out, did the new king and queen contemplate the scenes depicted above them? In addition to the hall, the Undercroft of the Banqueting House is open to the public. Here, James I used to drink and cavort with his courtiers. Today, it contains a cafe and a gift shop. 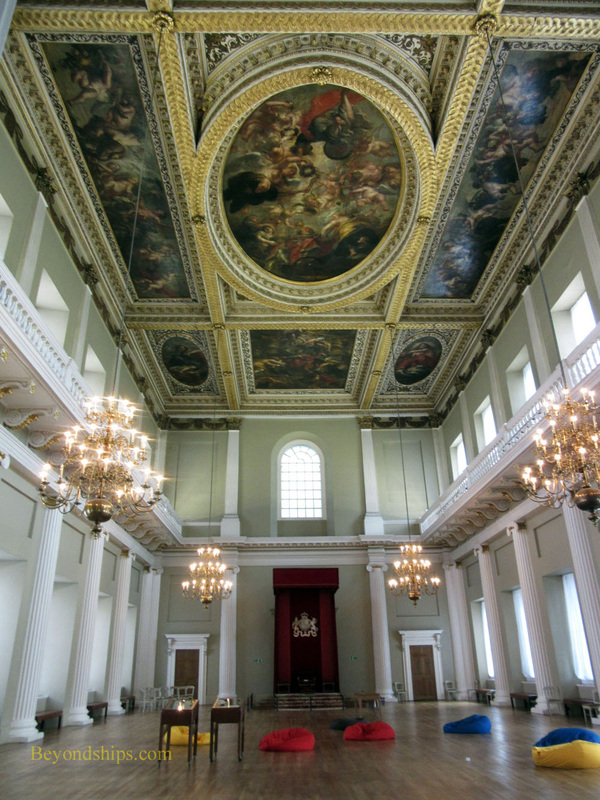 The Banqueting House is usually open Monday to Sunday but is sometimes closed for special events. For information on opening times and tickets, see the Historic Royal Palaces website.